The Southgate House will be the host for the 2nd annual Winter Blues Fest this Friday and Saturday. The doors will open at 6pm with performances going until about 1:30am or so (you know how these things go). The festival boasts 28 bands on 3 different stages and will offer a great way to spend the weekend and escape the cold for a bit. 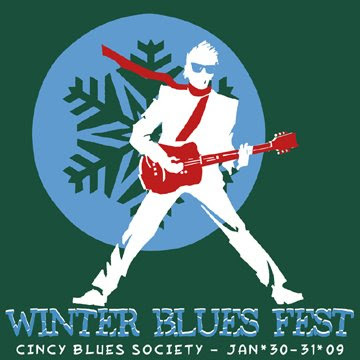 The festival serves as an annual fundraiser for the Blues in the Schools program. There will be youth performances in the lounge area both nights from 6:10 to 6:40pm. The Bluebirds and The Blue Shivers will be headlining on Friday and Saturday respectively. Tickets are $15 per person, per night and can be bought in advance or at the door. Blues Society members getting a $5 discount. Visit the festival's web site for more information on the list of bands and schedule of acts. The 17th annual Cincy Blues Fest will take place August 7th & 8th at Sawyer Point.